This page is best viewed in Horizontal/Landscape mode! 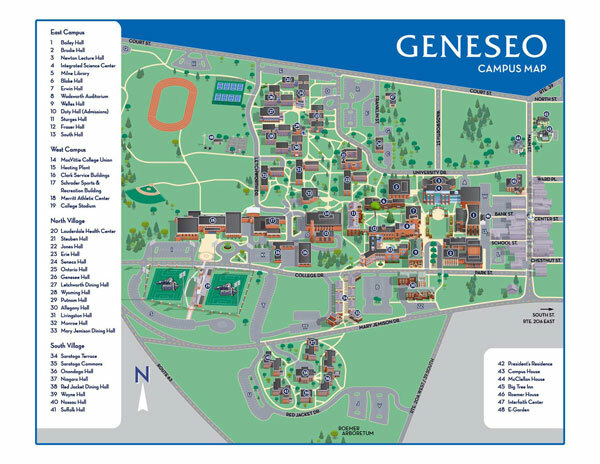 Planning a trip to Geneseo, click HERE for some helpful suggestions provided by SUNY Geneseo to campus visitors (note that central campus is adjacent to Geneseo's Main Street business district). 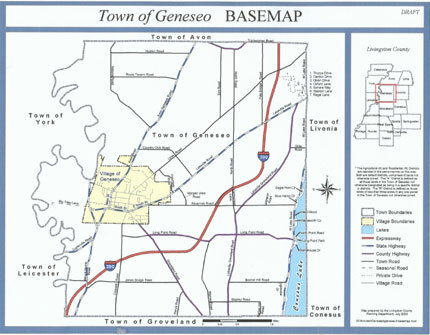 It is easy to reach Geneseo by car following either expressways or scenic byways. Take I-390 south to Route 20A (Exit 8); turn west (right). 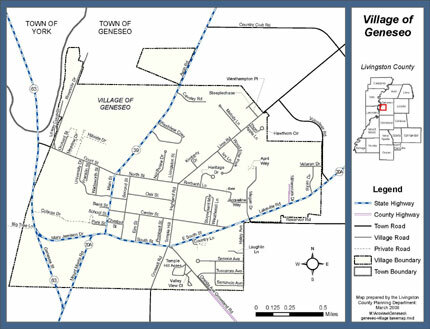 As you approach the Village limits in approximately 2 miles, you will see the Genesee Valley on the horizon. The Village center is reached in 4 miles. For a scenic route that follows the hillside overlooking the beautiful Genesee River Valley and passes by many horse farms, leave I-390 at Routes 5/20 (Exit 10). Take Routes 5/20 west (turn right) and follow it through the Village of Avon to the junction with Route 39. Turn left onto Route 39 and enjoy the next 9 miles to the Village of Geneseo. Take the New York State Thruway to Rochester (Exit 46); follow I-390 south using the same directions as above. For a scenic route, take Route 20A, which meanders through the lush Finger Lakes countryside, all the way to Geneseo. Take the New York State Thruway to Batavia (Exit 48); take Route 63 south to Geneseo for approximately 20 miles. Watch for the beautiful Genesee Valley ahead and see the lights of Geneseo as you approach our Village. For a scenic route, continue on the Thruway to Rochester (Exit 46); take I-390 south to Routes 5/20 (Exit 10). Take Routes 5/20 west (turn right) and follow it through the Village of Avon to the junction with Route 39. Turn left onto Route 39 and enjoy the next 9 miles to the Village of Geneseo. Take I-390 north to Route 63/408 (Exit 7); turn right and follow Route 63 past the salt mine; continue straight ahead to join Route 20A. Admire the Genesee River Valley on your left. As you pass the first group of SUNY Geneseo residence halls, a soft right turn on 20A brings you into the Village center.